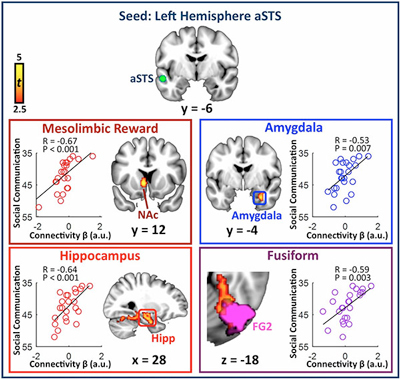 Functional connectivity during mother’s voice processing: Greater social communication abilities, reflected by smaller social communication scores, are associated with greater functional connectivity between a child’s left-hemisphere anterior superior temporal sulcus (aSTS) and left-hemisphere nucleus accumbens (NAc) of the mesolimbic reward pathway, right-hemisphere amygdala, hippocampus, and fusiform gyrus in response to the mother’s voice. Image from Abrams D.A. et al. (2016). A mother’s voice plays an important role in the development of social and emotional cues in infants and children, helping to guide behaviors and regulate stress. SFARI Investigator Vinod Menon and his colleagues have investigated the neural circuitry that supports this critical social cue. Using functional magnetic resonance imaging (fMRI) in typically developing children, the researchers found that the voice of a child’s mother more strongly activates auditory and voice processing systems, and reward, affective, memory, and face-processing regions compared with the voices of unknown females. Importantly, the strength of connectivity between voice perception regions and these other brain regions is predictive of a child’s social communication skills. These results are consistent with an earlier study from Menon and his colleagues, in which they showed — using resting state fMRI — that intrinsic connectivity between voice-selective cortex and reward pathways predicts social communication abilities in children with autism (Abrams et al., 2013). The researchers next plan to study whether the perception of biologically and socially salient voices are impaired in children with autism. Neural circuits underlying mother’s voice perception predict social communication abilities in children. Abrams D.A., Chen T., Odriozola P., Cheng K.M., Baker A.E., Padmanabhan A., Ryali S., Kochalka J., Feinstein C., Menon V.